Woodhall Press Llp, 9781949116021, 234pp. As American identity becomes increasingly fractured, LaRue Cook takes us on a deeply personal journey of self-discovery by a former corporate sports-editor-turned-Uber driver. At the age of thirty, Cook thought he had achieved the "American Dream"--a cushy job at ESPN; a long-term relationship; friendship and respect from his colleagues within the cutthroat industry of sports media. Still, he felt troubled and restless, attempting in vain to live up to the journalistic legacy of his late father, the man whose early death he'd never reconciled. And so he left. He moved from Connecticut back to his native Tennessee, hoping to find solace in the place where he'd first found meaning as a writer. To help pay the bills, he started driving for Uber and found himself looking in the rearview mirror, sharing stories with people across race and class, gender and ethnicity--all while the United States experienced one of the most polarizing presidential elections in its history. 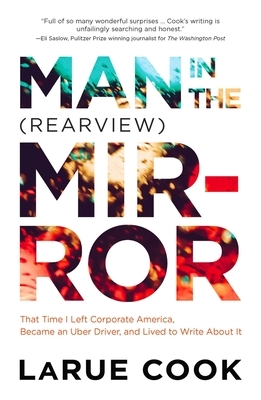 Part voyeuristic, part inspirational, sometimes hilarious, always thoughtful and probing, Man in the (Rearview) Mirror is a book about learning how to love yourself at a time in America when it is often too easy to hate. With compassion for his passengers and himself, Cook carefully navigates us to a place of forgiveness, patience, and, hopefully, peace.